After being completely overwhelmed at the giant Outdoor Retailer’s show in Denver this past weekend, I’ve emerged from the adrenaline fog. Three major themes jumped out of the Colorado Convention Center, and they’re worth sharing with you. These retailers are on to the hottest and fastest growing segment in the hiking niche of outdoor space. 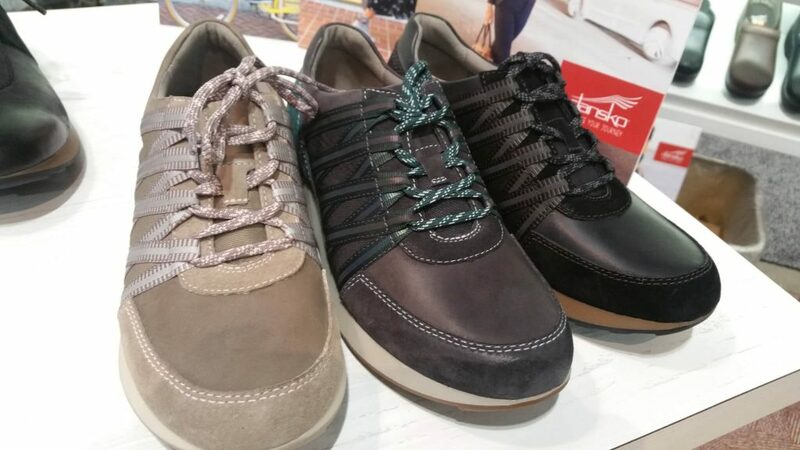 Everyone, from Keen to Dansko, is on to urban hiking! 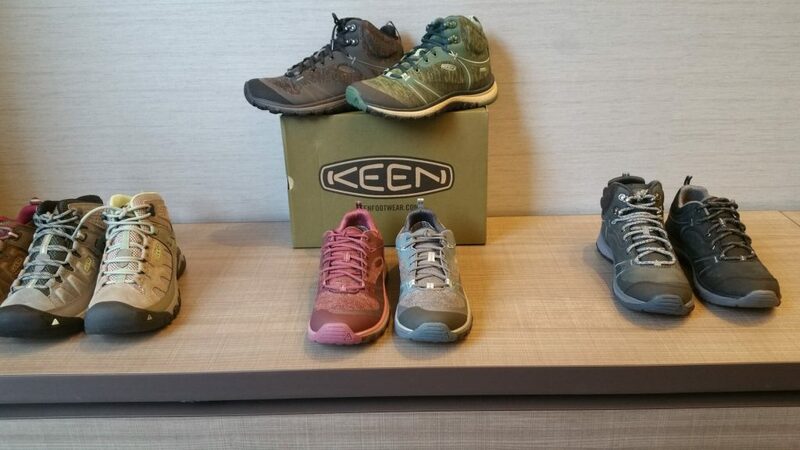 Keen even had a special display called “Urban Hiking for the Family.” Watch for new colors in the Terradora line, a push of their EvoFits for the summer, and a new style in their Targhees. What was great to see is Dansko breaking into the space with their Paisley line. I’ve always thought of Dansko as a clog or shoe for the allied health industries, but their urban hiker is striking and ready to take aim at real city, street, and hard surface walking. One of the greatest benefits of walking, as compared to other outdoor pursuits, is that it’s affordable and doesn’t require a lot of gear. And while there’s no shortage of new performance fabric layers and high-tech outerwear on the market, it’s encouraging to see many companies returning to basics and advocating reuse, repair and reduced waste of outdoor gear. That mindset meshes beautifully with the walking lifestyle, embraced by many who want to decrease their impact on the planet while reaping the rewards of outdoor activity. We found a few examples at the show. Patagonia is perhaps the best-known clothing company to actively assist customers in extending the life of their gear. 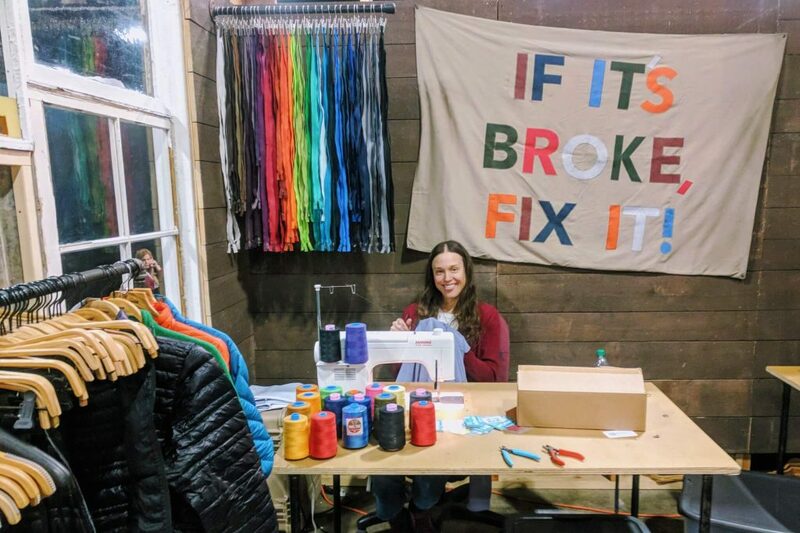 At Outdoor Retailer, the Patagonia booth featured an employee with a sewing machine, fixing damaged clothes on site. In addition to fixing anything customers want repaired, the company also offers a Worn Wear program, which puts gently used Patagonia clothing back on the market at a reduced price. Of course, staying comfortable in your outdoor gear is key to making walking a natural way of life. 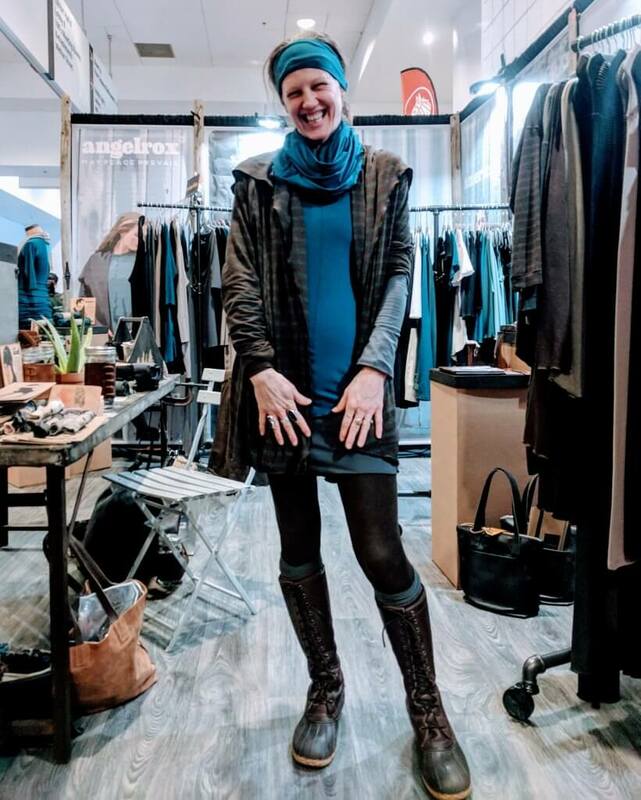 We loved meeting Roxi Sugar, owner and designer of the Angelrox clothing brand, and learning about her American-made, sustainably sourced bamboo basics. Angelrox features simple, beautiful pieces women can layer for walking just about anywhere. The soft fabrics pack well, too, making them ideal for active vacations or work trips. Roxi and her team design and manufacture Angelrox clothing in Maine, reducing emissions and keeping waste to a minimum. It is available online or in select boutiques around the country. The third wow moment we had was in the Farm to Feet booth. Straight from their American sheep pasturing in the US come their US-made, merino wool socks. A great fit, a great story, and a great company add up to a sock that’s durable and aims to keep socks out of the landfill because they stay on your feet longer. Back in 2012, Business Insider reported that 67% of women are plus-sized. But if you walk into your local outdoor retailer, their inventory certainly doesn’t reflect this statistic. Typical stores have racks and racks of colors, cuts, and shapes for the 0-14 sized women, but when viewing the plus-sized category, it’s slim pickings. That’s about to change. We’d like to throw major kudos out to REI for leading the charge with their women-only marketing campaigns and for their leadership in encouraging outdoor apparel companies to jump into this category of women who want to look great while urban hiking. REI will be coming out with an expanded selection of REI-branded apparel in the spring for their plus-sized customer. And what we love is that they aren’t calling it “Plus.” They just want to you to Find your Fit, and,double bonus, they will NOT charge extra for larger sized clothing. Kudos also goes to Columbia for being in this space for over 20 years. They, too, are expanding the colors, shapes, and styles for their plus-sized customer, not limiting choice to particular sizes. Let’s also not forget Prana. Starting next year, they, too, will expand their product lines into the plus category. And get this: they will not just upsize their current fits. They’re using real models with real proportions wearing real clothes. Isn’t that refreshing? Even though the Outdoor Retailer show was overwhelming, taking over the entire Colorado Convention Center, the three themes of Urban Hiking, Sustainability, and Fit popped out of the booths and into our minds. We were thrilled to attend, and more importantly, we were super excited that the show has come to Denver and will be back in late summer for the second show of the year. We can’t wait to see how these themes grow and how Keen, Patagonia, Dansko, REI, Angelrox, Prana and Farm to Feet include walking and urban hiking into their future plans.